Science. Technology. Engineering. Maths. Medicine. Fascinating subjects and mind-blowing research is presented to you live on stage in bite size talks at the FameLab UK Grand Final – science geekery galore! 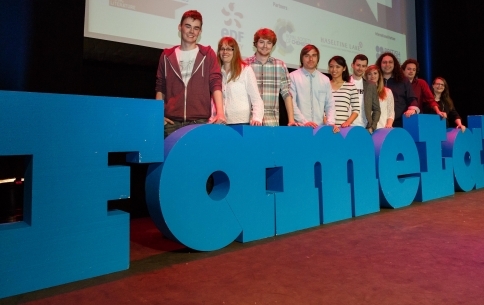 Following an exciting season of over 20 competition heats and regional finals all across England, Scotland, Wales and Northern Ireland, the FameLab UK Final pits the country’s very best young science communicators head to head for your viewing (and understanding) pleasure. Our finalists will have three minutes on stage to explain a complex science concept in a unique, entertaining and understandable way and will be judged by a panel of experts (and you!) on the 3 Cs: content, clarity and charisma. The FameLab UK champion will then go on to represent the country at the FameLab International Final, competing with finalists from 30 nations across the globe at The Times Cheltenham Science Festival this June. Joining us this evening are our incomparable host, Quentin Cooper as well as chemist and science communicator Dr Kathryn Harkup who will be giving us a beginners 101 on deathly poisons. *Fees are £2.50 for online and telephone sales, and £1.50 for in person sales with credit/debit card. No fee for cash sales.